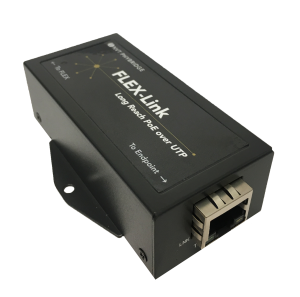 FLEX-Link is IEEE-compliant and negotiates power requirements with an IP device, delivers 50W of power over 4-pairs, and can be locally powered. 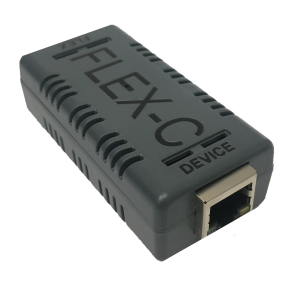 FLEX-C supports IEEE-compliant devices with lower power requirements. 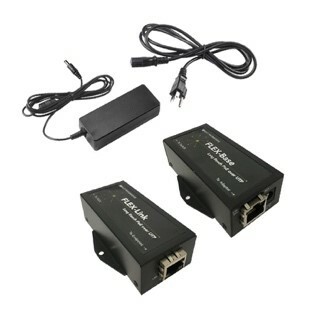 DC IN (Barrel Connector) Optional (sold separately) 48V – 56VDC via an external AC/DC Power Adapter (IEC Class II isolated only) NOTE 1: Local power supply used must have its output isolated from Earth potential. NOTE 2: If voltage of local power supply is lower than the voltage provided from the PoE switch, then power on the PoE switch should be turned off. Interface: for IP End Device (IEEE side) RJ45 port; device must be IEEE 802.3 af/at compliant and it must be plugged in while PoE negotiation takes place between the switch and device. 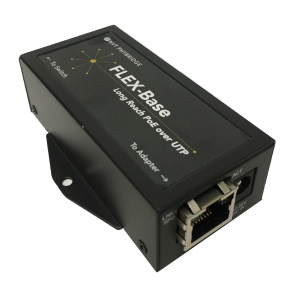 If power is directly sent from the FLEX24 Switch (no negotiations) or FLEX-Base, then since line will be powered, IEEE 802.3 af/at non-compliant devices may be damaged. DC IN (Barrel Connector) Optional (sold separately) 48V – 56VDC via an external AC/DC Power Adapter (IEC Class II isolated only) NOTE: local power supply must have its output isolated from Earth potential. Datasheet The 55VDC 60W optional power supply to locally power the FLEX-Link adapter. Datasheet The 55VDC 110W optional power supply to locally power the FLEX4 adapter. 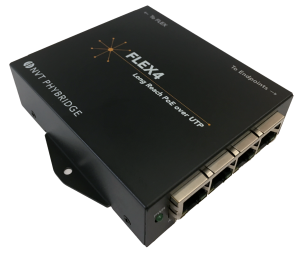 The FLEX Extender Kits are robust, convenient to order, long reach single port UTP solutions. 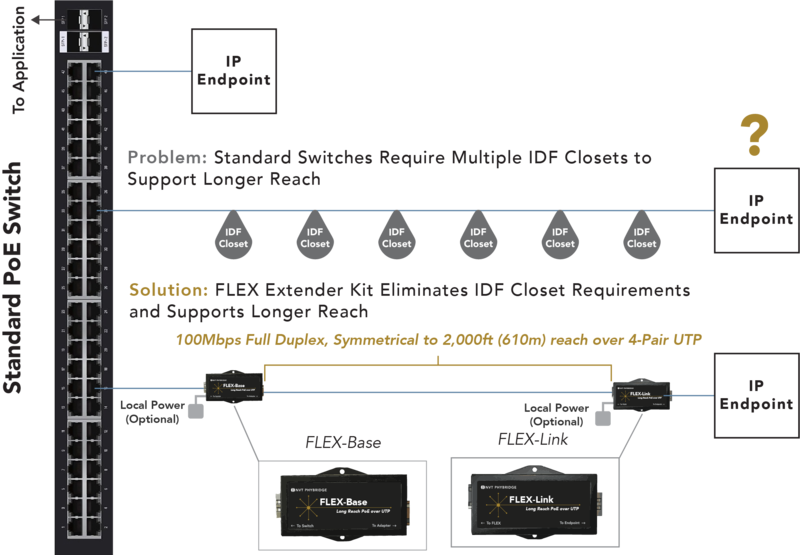 The FLEX-Link and FLEX4, when connected to the FLEX-Base unit via 2 or 4 pair UTP can deliver 100Mbps (symmetrical full duplex) with up to 50 watts of power with 2,000ft (610m) reach.